Services for John Allen Roberson, age 84 of Grapeland will be held at 10:00 A.M. Thursday at Southside Baptist Church with Rev. Kenny Bush and Rev. David English officiating. Burial will follow in Guiceland Cemetery. Arrangements are under the direction of Bailey & Foster. Mr. Roberson died Monday at his residence. He was born to Allen Jesse and Buncie Elizabeth Roberson on June 28, 1932 in Truth or Consequences, NM. (now known as Hot Springs). After graduating high school, John joined the Navy (1950-1954) as a radar technician. Afterwards he worked for the Air Force (1955-1959) and Navy (1959-1962) in Civil Service capacity as an electronic technician. He then began his career for NASA (1962-retired 1979) as a Flight Systems Test Engineer. During his time at NASA, he was an intricate part in multiple space missions, to include helping to design and build the supersonic sled in China Lake, CA., and the land rover (Moon Buggy) in Houston, Texas. In 1971, he graduated from the University of Houston with a Bachelor of Science degree, emphasis in Mathematical Engineering. After retirement, he moved to Grapeland, TX. and built his home. He then operated a bull dozer, worked for Garrett Metal Detectors (1995-1997), owned and operated a Christmas tree farm for 17 years and worked as a building contractor. In 1997, he attained his real estate license and had a successful career in Tyler and Palestine, Texas (Sussdorf Real Estate). He was a member of the Masons, Palestine chamber of Commerce, in which he was President for two years and Ambassador (1998-2004), and the Grapeland Noon Lions Club. 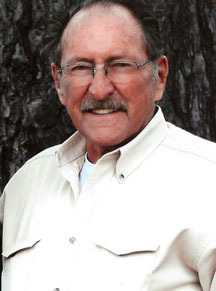 He was an active member of Southside Baptist Church in Palestine, TX. He loved being with family, friends, and playing bluegrass music on guitar, mandolin, banjo and standup bass. He taught his children the same love of music and instruments and taught them how to play. He also enjoyed having different projects to build and was eager to teach his children the same skill. He loved to travel, camping and gardening. He enjoyed his life to the fullest. Pallbearers are Jay and Travis Roberson, Donnie and Allen Smith, Bobby Jackson, Greg Molandes, Mark and Ted Salmon. Visitation was held from 6:00 to 8:00 P.M. Wednesday at Bailey & Foster Funeral Chapel, Grapeland. Our family would like to thank Jordan Home Health and Solaris Hospice for their kindness and compassion during our difficult time. Also, thank you for all the prayers and support from our friends, family and even those that did not know him. Donations may be made to The Gideons, Grapeland Noon Lions Club or to Solaris Hospice.